Our competency lies in offering our clients an excellent quality range of Cable Cubby. 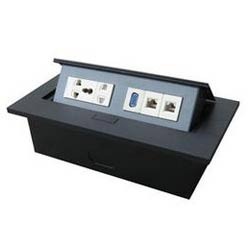 By making this cable cubby only advance tools and latest technology are used along with optimum quality material. Furthermore, this cable cubby is available at affordable rates for our customers scattered across the nation. The offered cable cubby is checked on quality provisions by our vendor’s quality experts in order to ensure flawless range. We, Miyakawa Drives & Controls Private Limited, established our operations in the year 1999, as one of the celebrated traders, suppliers, distributors, importers of a broad selection of Drives and Controls. Our product array encompasses Cables, Sound Speakers & Amplifiers and Connectors that are manufactured as per the predefined industry guidelines, for keeping up with the quality standards, at the location of our vendors. Moreover, premium quality raw materials are used for the manufacturing process, at vendors’ unit. In past years, we have established our name across the globe and earned the immense trust of clients, with our excellent product series. Our company is backed by a gigantic warehouse facility that is set up with a series of machines, tools and equipment that support us in attaining the excellence standards. Moreover, we have recruited a team of qualified and knowledgeable professionals, who work extremely hard to accomplish the set organizational objectives. Our product range is imported from China, Singapore, USA, Netherlands, UK and Sweden.